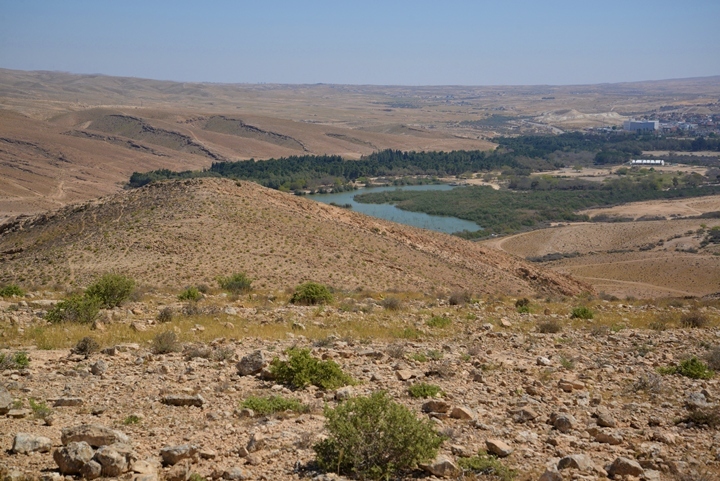 Prehistoric sites on hills above lake Yeruham, dated to the Middle Bronze I period; including a settlement, burial heaps and Amorite temple. 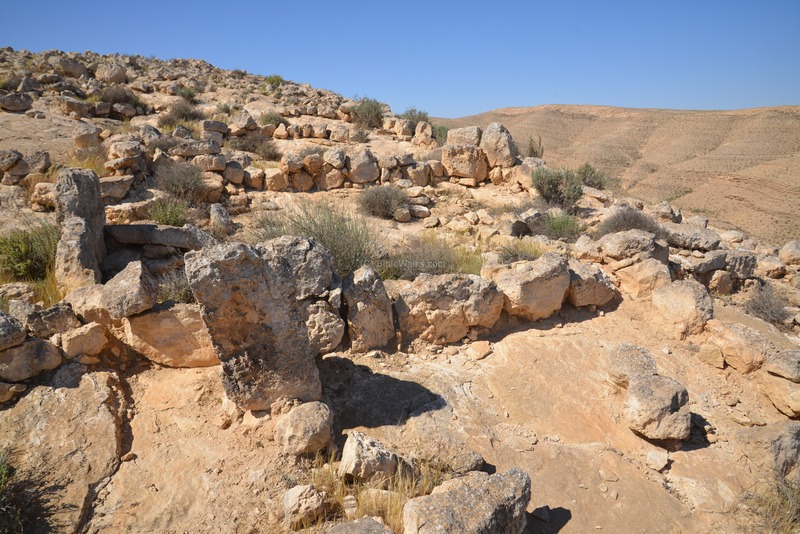 On Har Yeruham ('Mount Yeruham'), in the Central Negev desert area, are a number of prehistoric sites, including a settlement, tombs and temple. These sites are dated to the Middle Bronze 1 period, about 4,000 years ago. This may have been a ritual and burial center spanning hundreds of years. The prehistoric sites of Har Yeruham are located on the southwest side of Lake Yeruham park. Drive your car around the north side of the lake, and park close to the dam. From there, climb up the ascent path marked with white-blue strip markers. The major site (#140) is reached after the steep climb. 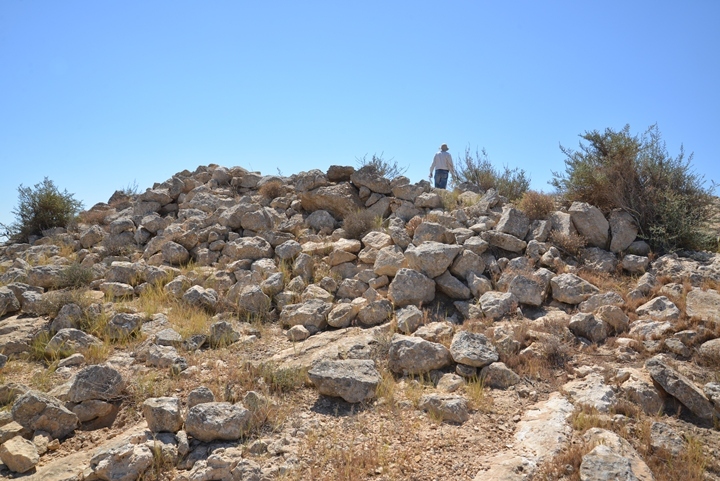 From there you can continue along the path, reaching site #123 (burial heaps), then descend to the Amorite temple site (#138) and along an easy path down back to the dam. 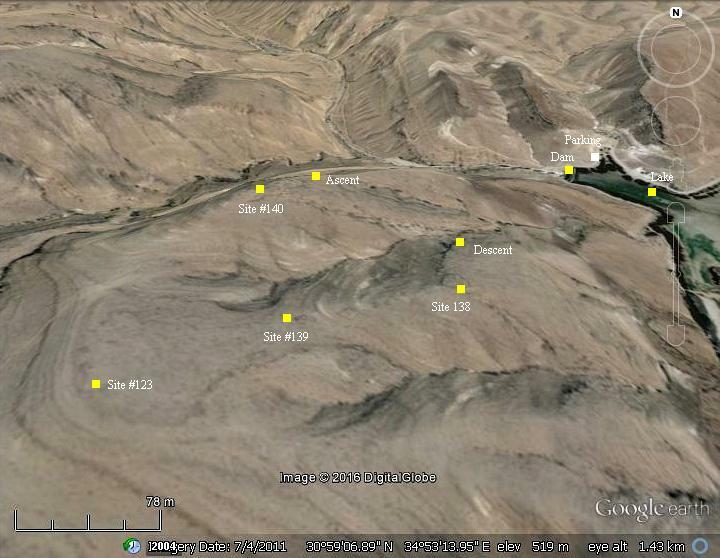 The numbering of the sites in this web page is based on the Archaeological survey [links]. 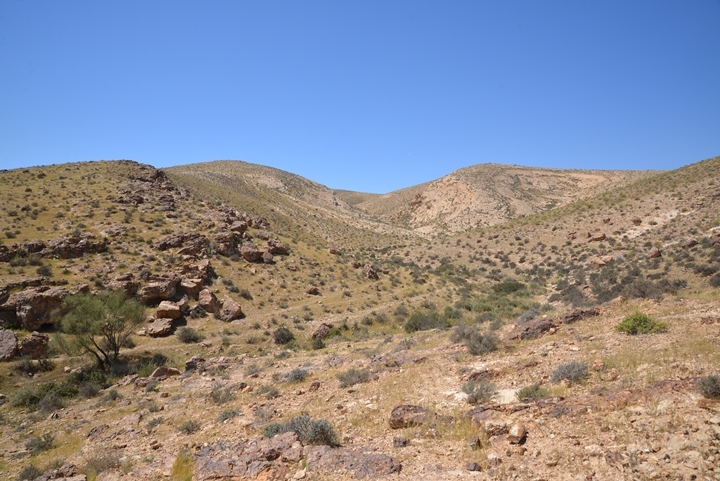 The area of Yeruham is located on the side of ancient routes passing thru the Great Crater. Therefore, many ancient sites can be found in this area, starting from the stone age and spanning all periods until the modern times. The Intermediate Bronze (IB) period of the Israeli archaeology is also known as Early Bronze IV (2400-2200 B.C.) or Middle Bronze I (MB1, 2200-2000 B.C.). 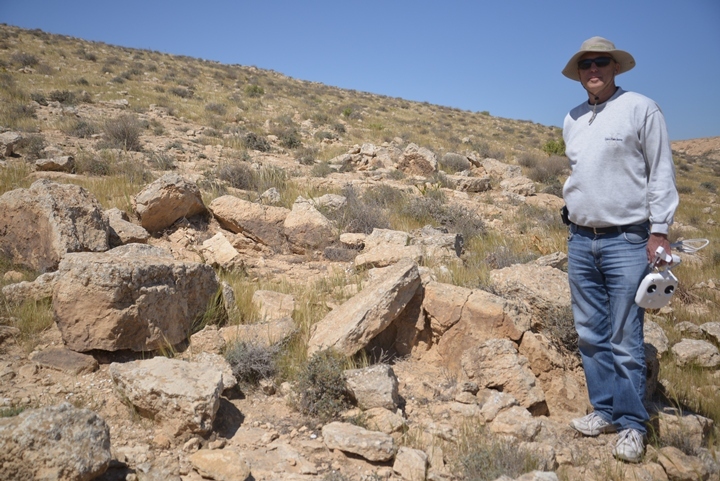 Some archaeologists of the Jordan Valley start the period in 2600 BC, while other date the end at 1950 B.C. In any case, it is a period of great changes from the Early Bronze to the Middle Bronze period. In the remainder of this web page the period will be referred as Middle Bronze I (MB1). 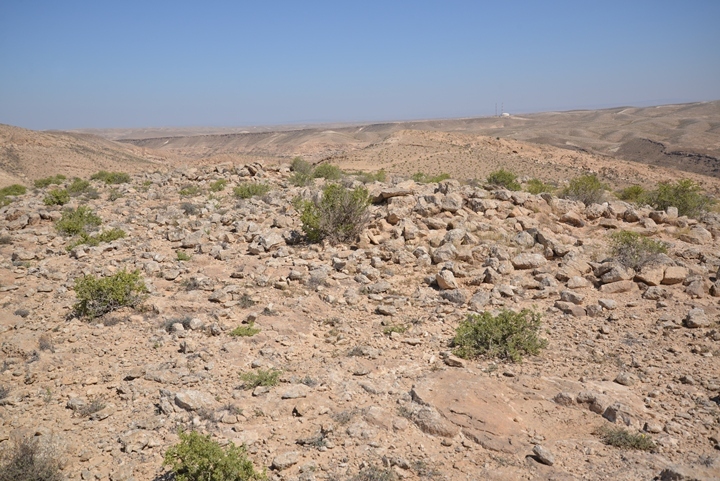 Towards the end of the Early Bronze period (3050-2400 BC) most of the large fortified cities were depopulated in the Levant. Old empires collapsed, like the Old Kingdom in Egypt that witnessed turbulent times and chaos. It may have been a result of onset of drier climatic conditions, which resulted in insufficient resources to support the large cities. This was a dramatic social change - the shift from urban to non-urban life. The sources of income also changed to a pastoral and agricultural society, with emphasis on herding rather than farming. The population moved to smaller, seasonal and scattered camp sites that required less resources. None of these sites were fortified, as opposed to the formidable cities of the Early Bronze period. Settlements were mostly inhabited by nomads or semi-nomads, and built on summits or slopes of high hills. During the MB1 period, a permanent settlement was established on a hilltop southwest of the Lake. In the settlement are 30 connected dwelling structures, creating a compact form around a large central courtyard. 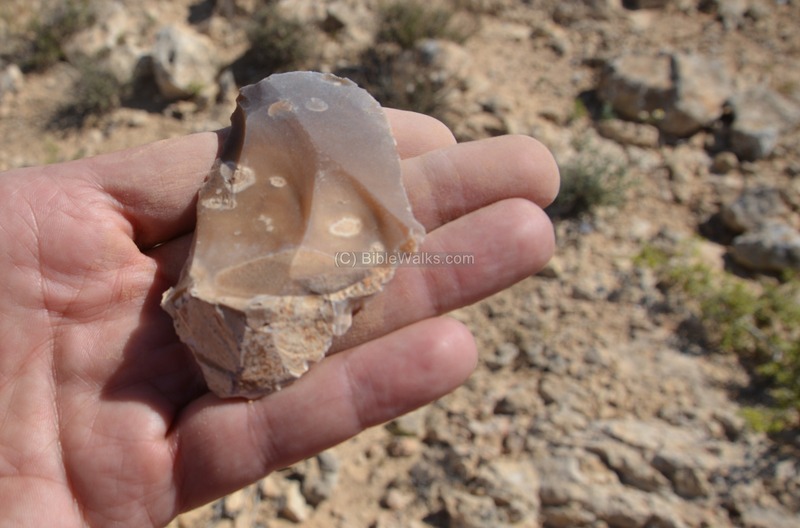 The site was one of the largest permanent settlements among the several hundreds of MB1 sites in the Negev. 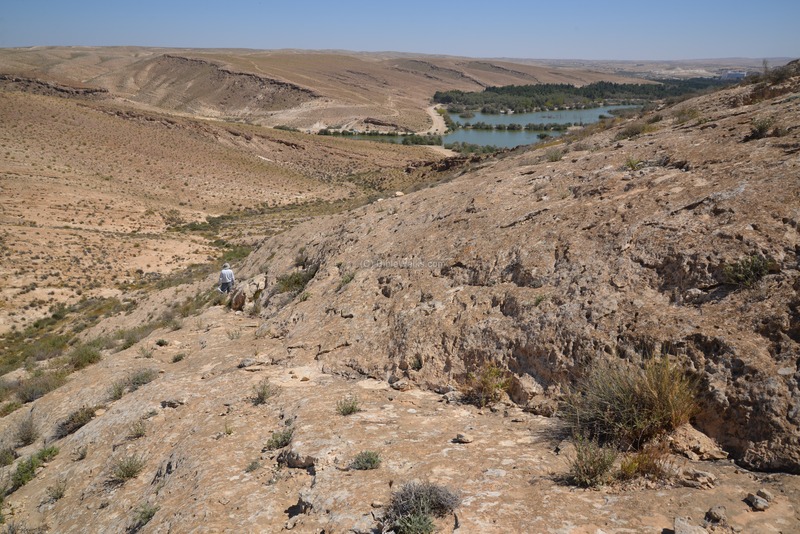 It covers 2 dunams, and is protected by deep valleys on two sides and buildings built along the external walls of the settlement. The excavator, M. Kochavi, identified two levels of settlement during the MB I period. Tumuli (burial heaps) were found on the ridges inside and around the settlement. Another interesting site is located across the valley on another hill top, featuring an enclosed area surrounding the peak. According to the excavator, it may have been an Amorite temple. The Amorites were an ancient Semitic-speaking people who originated from Syria, and dominated the Levant from the 21st Century to the 17th Century BC. The Bible writes about their origin as forth son of Canaan (Genesis 10:15-16): "And Canaan begat ...And the Jebusite, and the Amorite"). They are known to establish the city of Babylon, among other cities in Mesopotamia. In Israel, they dwelled in the Judean desert and the Jordanian mountains between Jabbok and Arnon brooks (Numbers 13:29): "...And the Amorites, dwell in the mountains...". Moses captured their country (Numbers 13:32): "And Moses ... took the villages thereof, and drove out the Amorites that were there". Their land was divided among the tribes of Judah (west of the Jordan) and Reuben and Gad (east of Jordan river). However, after the conquest of Israel, the Israelites encountered resistance from the remaining Amorites in Judea. 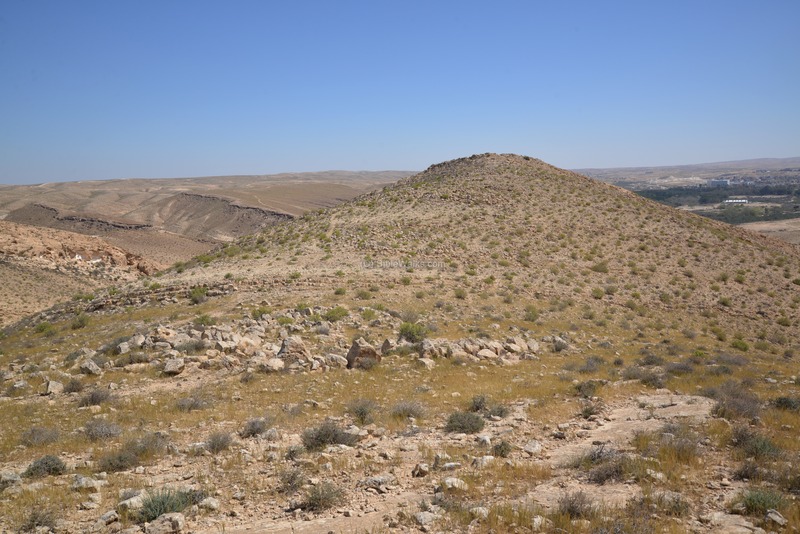 In the campaign of the city of Gibeon, Joshua faced a coalition of 5 Amorite kings (Joshua 10:5): "Therefore the five kings of the Amorites, the king of Jerusalem, the king of Hebron, the king of Jarmuth, the king of Lachish, the king of Eglon, gathered themselves together, and went up, they and all their hosts, and encamped before Gibeon, and made war against it". The Israelites chased down to Azekah, slew the Amorites, and God casted great hailstones which destroyed them. A fortified city was established during the Israelite times on a steep hill adjacent to modern day town of Yeruham. This site will be featured in another page. 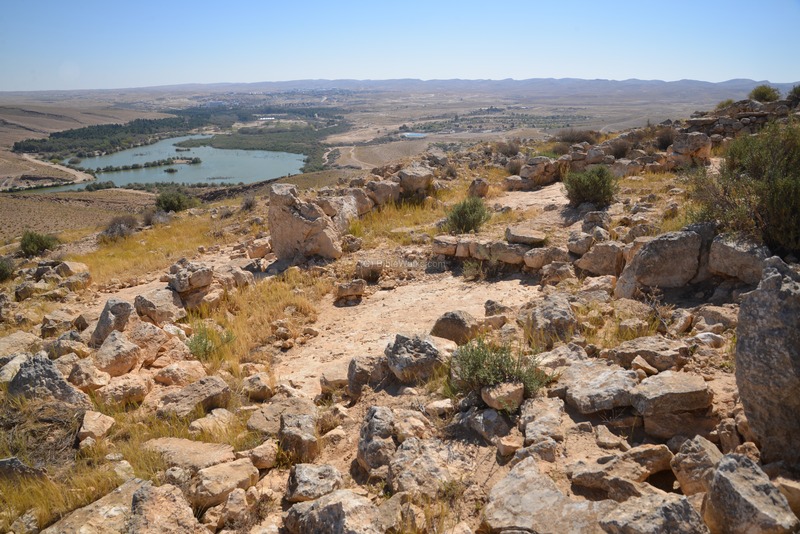 The city in Tel Yeruham appears in the list of sites conquered in 924 BC by Shishak, king of Egypt. The conquest of Tel Yeruham appears on a wall in his palace in Upper Egypt, and the name appears as Y-r-h-m. 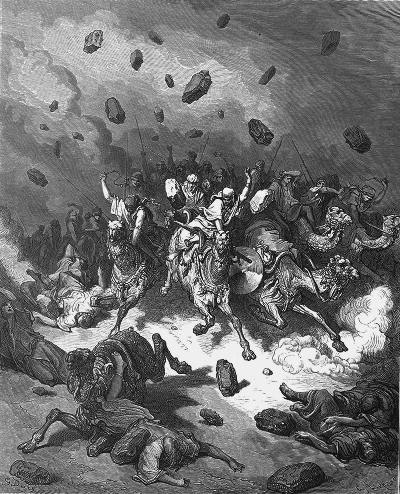 This event was also described by the Bible (2 Chronicle 12:4): "And it came to pass, that in the fifth year of king Rehoboam, Shishak king of Egypt came up against Jerusalem, because they had transgressed against the LORD, With twelve hundred chariots, and threescore thousand horsemen: and the people were without number that came with him out of Egypt; the Lubims, the Sukkiims, and the Ethiopians. And he took the fenced cities which pertained to Judah, and came to Jerusalem". On the southeast side of Lake Yeruham was one of the stations along the Nabatean trade route - known as the Incense & Spice route. The Roman period site will be featured in another page. In 1951 a town was established near the Great Crater, initially housing the workers in the crater and immigrants. It was named after Tel Yeruham, which is adjacent to the town. 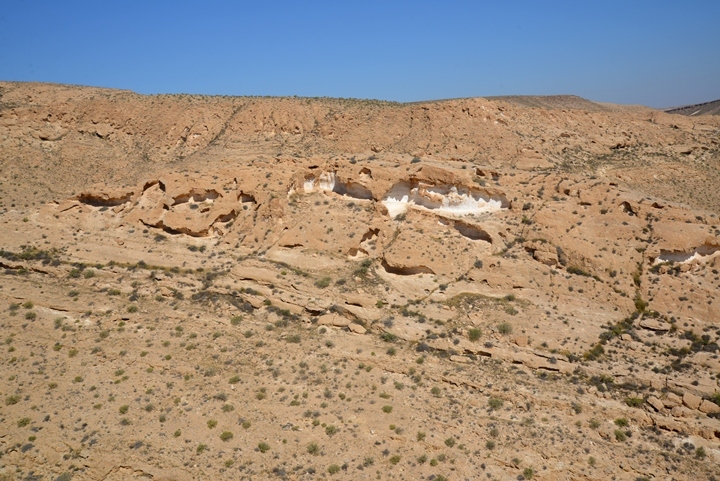 The site was excavated by M. Kochavi in 1963 and by Dr. Rudolph Cohen in the 1970s. Dr. Cohen was also known to propose in an article that the MB I people were the Israelites of the Exodus, although conventional scholars identified the MB I people to the nomadic Israelites in the earlier times of Abraham (at a date of about 2000 B.C.). Other scholars such as Kathleen Kenyon suggest to identify the MB I people in the Negev as Amorites. The prehistoric site of Har Yeruham is located in an open public area, 3km west of the town, on the south west side of Yeruham Lake. Although there is a steep ascent to the large site, it is a recommended 2 hour round hike which can be added to a picnic and rest near the lake. 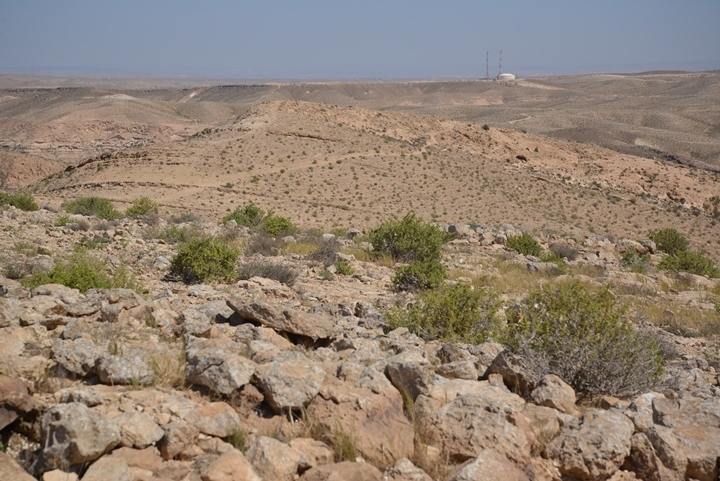 The major MB1 site is located on a slope, southwest of Lake Yeruham. This aerial view was captured by a drone in April 2016. A closer view of the southern section of the site is shown in the next aerial view. This YouTube video shows a flight of a drone over the site, and a view of its surroundings. 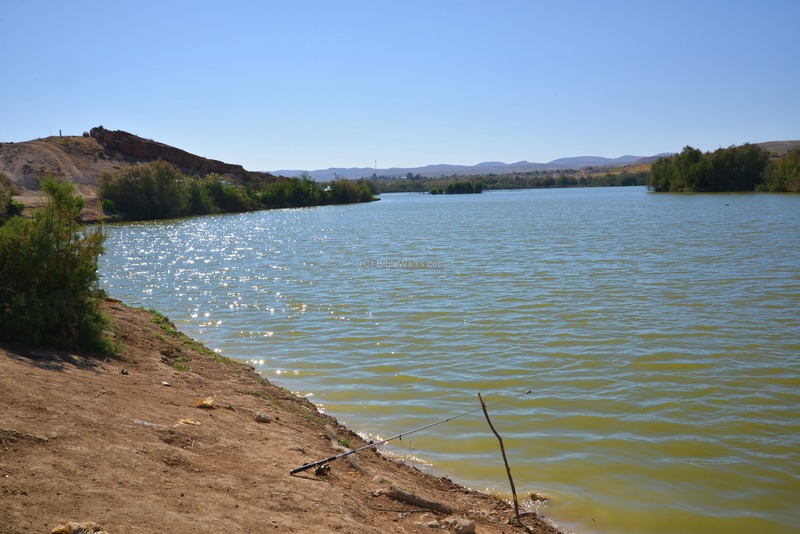 From the dam of Lake Yeruham is a steep ascent path that leads to the largest site. 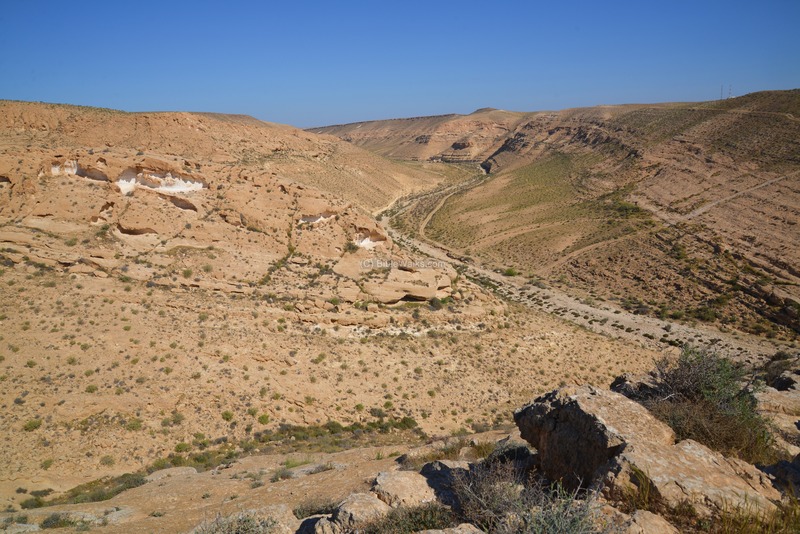 The path, marked by blue and white strips, starts from Nahal Revivim stream then climbs up along the cliffs. 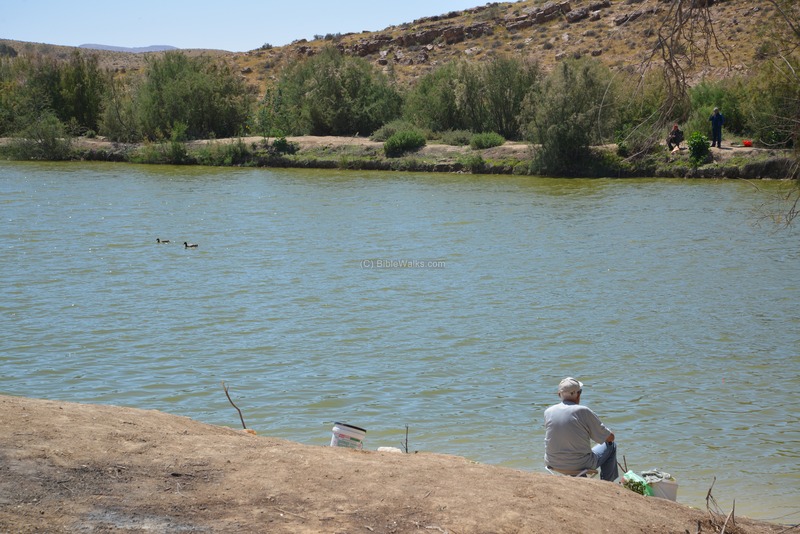 The photo below shows the view of Nahal Revivim stream. 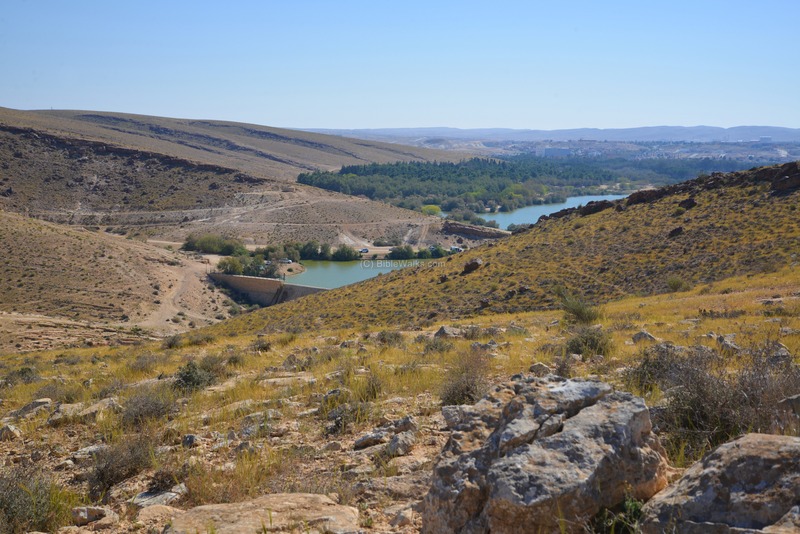 Its valley was once one of the routes that led to the plains on the west, passing through Mashabei Sadeh where another larger MB1 settlement was located 15 KM away. 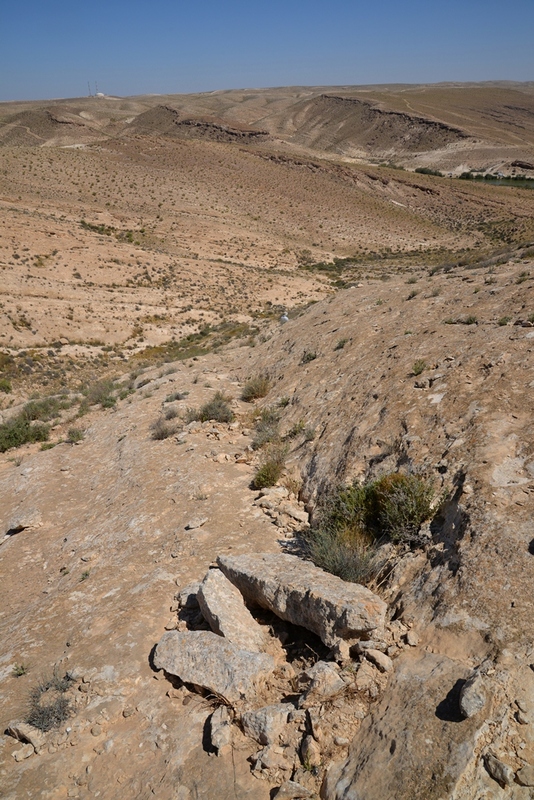 The path overviews the white chalk cliffs above the valley of Nahal Kalanit. The ruins of the settlement are visible while climbing up the path. The path enters through the north end of the settlement. The northern side of the settlement provides a great view of the lake. Traces of the ancient building are seen beyond the base of the external wall of the settlement. The "buildings", or rather small rooms, are built over the natural rock face. Some of the surfaces were leveled to handle the natural irregularities. Their plan is rectangular or elliptical, and they range in size of 1.5m x 2.0m to 3.0 x 6.0 m. Some of the rooms connect to each other, and form a cluster that surrounds a common courtyard. A total of 6 clusters, each with ~5 dwelling rooms and storage structures, were identified in the settlement. The outer side of the houses form the external wall of the site, thus providing a defense line similar to the casemate wall design found in the later period (Iron Age) city walls. The following photo shows the north eastern buildings, with their wall along the eastern external wall. The external wall surrounded most of the circumference of the settlement. The next photo shows the north western buildings, also aligned along the western external wall. Notice the upright stone that stood at the entrance to the building. An aerial view of the north west side of settlement is seen in the next photo. The buildings are aligned along the steep edge of the ridge. The central column was based on a single or several long vertical stones that supported several wooden beams. The wooden beams were laid in a radial fashion from the center column to the side walls. Flat stone slabs were placed above the beams, with mud sealing the cracks, thus sealing the structure from all sides but the entrance. The dwelling structure thus became isolated. 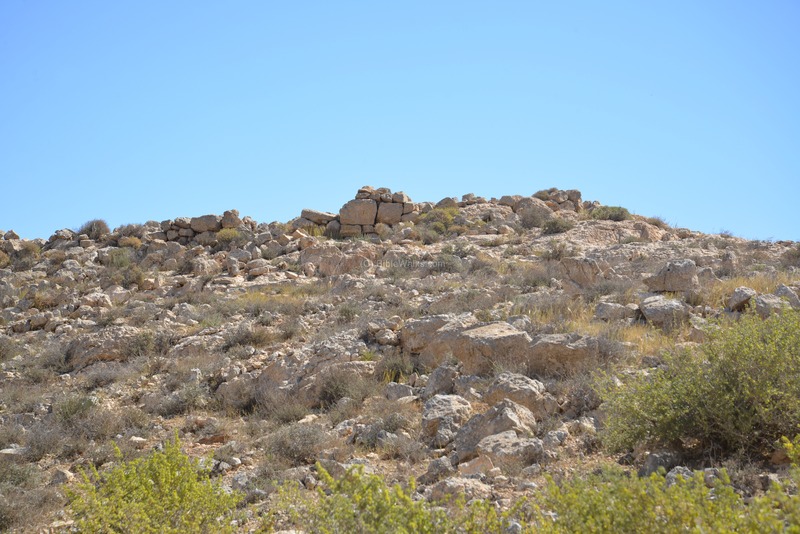 The advantage of stone walls and roof is that they keep the house cold and shaded during the heat of the day, while warm during the cold desert nights. 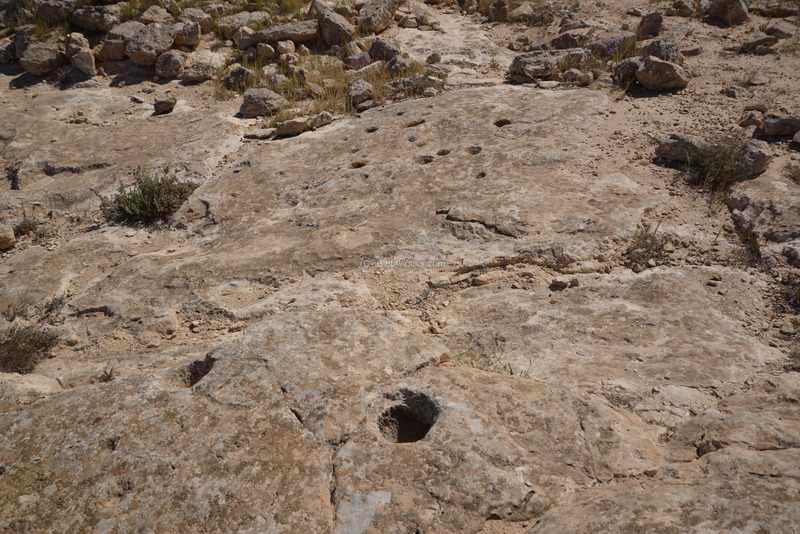 In Har Yeruham site most of the rooms were rectangular or elliptical. The roof was supported by a central column or a number of columns standing, and perhaps was a woolen cloth roof. Stone benches ran along the walls along some of the houses. A large courtyard (20m x 45m) was also located in the south side of the site (seen below on the left side), as well as two clusters with rooms around common courtyards. The aerial view shows the southern side of the settlement, and the steep edge on the west side. Below - a closer view of the southwestern side, focusing on the south most cluster of rooms. Flintstones: Flint is a hard sedimentary rock that breaks with curved breakages (conchoidal fractures), causing it to split into sharp edge pieces. 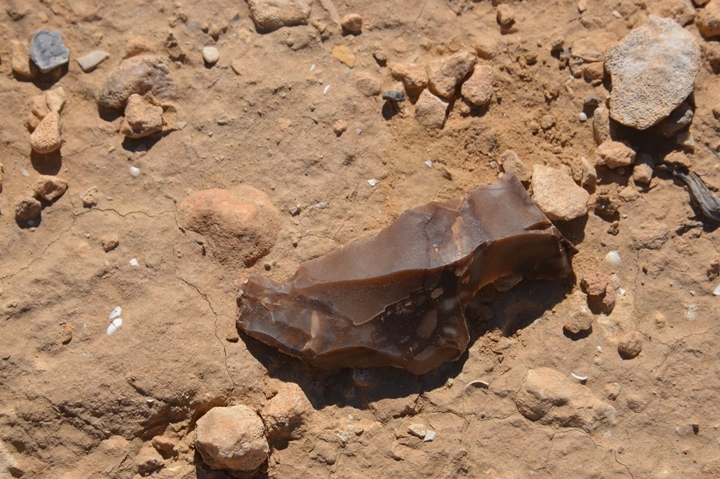 It was the preferred material for making tools during the early times, such as knife blades, arrow heads, axes, scrappers, spear points and more useful tools. 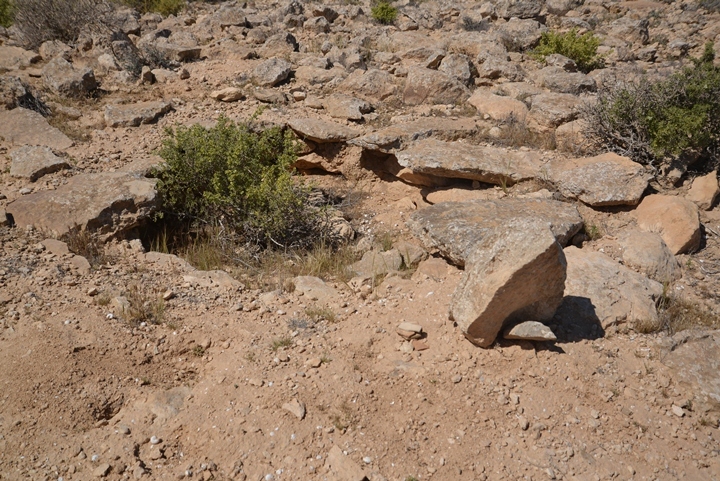 A source of Flintstones is located near the lake area. 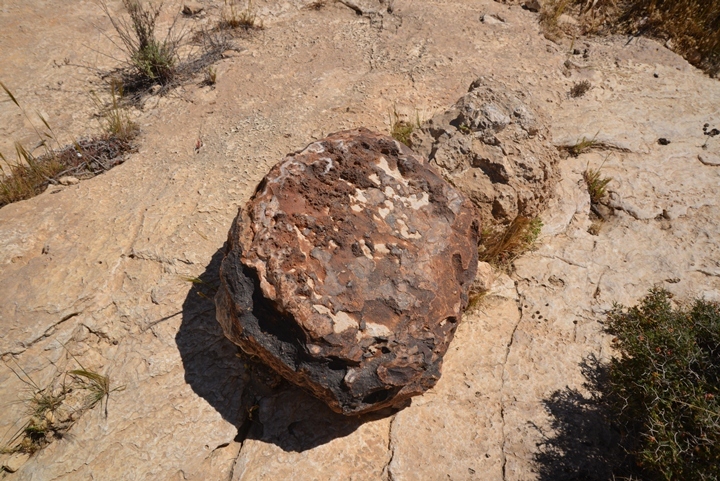 These two photos show a sample of the many stones found inside and around the site. 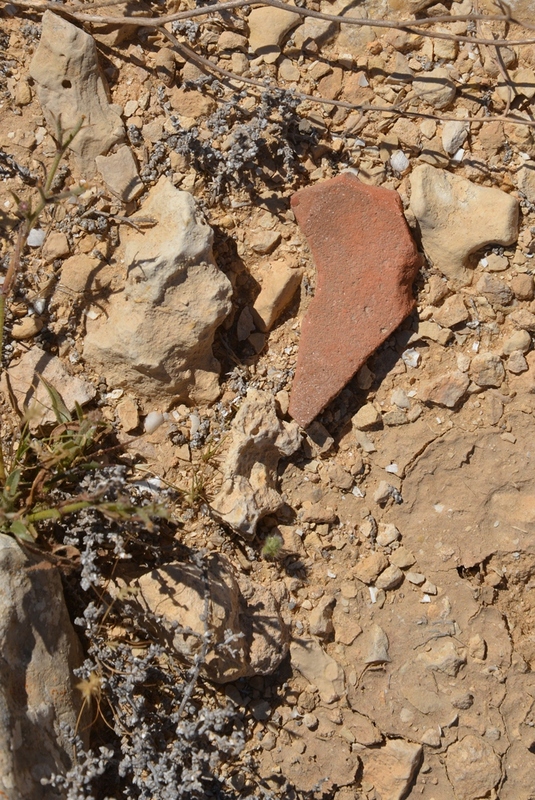 Pottery: All over the sites are fragments of ceramics. Pottery was heavily used during the Bronze Age for different uses, such as cookware and storage vessels. Some of the ceramics were manufactured locally in Har Yeruham, as a pottery workshop was found here - a kiln, stone structure and kiln debris. This is the only site where such pre-Classical pottery workshops were found to date in the central Negev area. 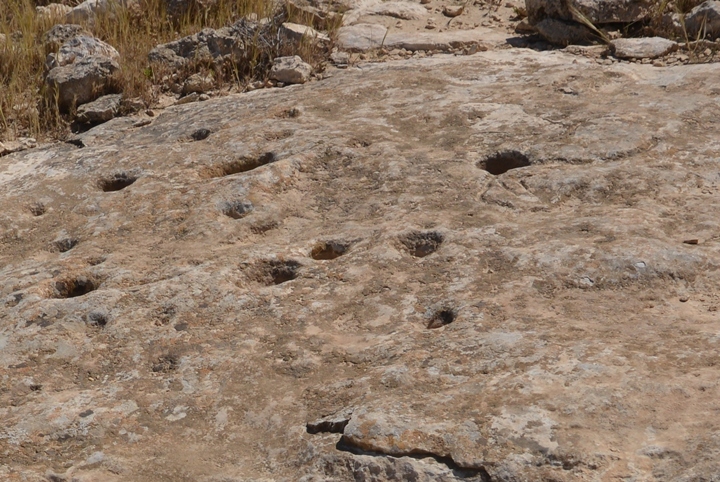 Cup Marks: The Early Man also cut into the local rocks to create agriculture installations. In the photo are cup marks - small holes carved into the local stone. They may have been used to grind grain, using a flint stone to crush the grain inside the groove. A closer view of the cluster of cup marks is below. Notice that there are engraved lines leading into some of the cup marks. Metalworking: M. Kochavi found 17 copper ingots and fragments stashed in a hidden hoard. The copper was mined in the Feinan area, east of Hezeva, and was then traded to the settlement in the form of crescent-shaped bar ingots. Kochavi also uncovered a cylindrical clay vessel which may have been used to melt the copper. Similar crescent-shaped bar ingots were found in Early and Middle Bronze period sites in the Negev Highlands and in the north. The narrow and long bars, made of very pure copper, were used for the production of Bronze, after being alloyed with tin. The copper ingots were also used for the final product. A panoramic view from the center of the site is shown here. Pressing on this picture will pop up the panoramic viewer. Using this flash-based panoramic viewer, you can move around, zooming in and out - viewing the site in the amazing full screen mode (like you are really there). Major sites are marked on the views. It may take minutes to upload, but then its worth the waiting time. The next site, 350m south of the main site, is located on the hilltop, at an altitude of 553m. Six MB1 burial tumuli, with diameters of 5m, are located on this hilltop. Three of the tumuli were found excavated, and one of them had an opened burial chamber. 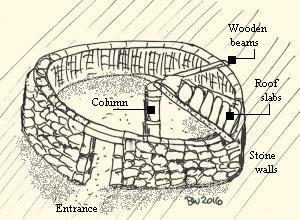 The most common tumulus of the Intermediate Bronze period is a shallow circular pile of stones, about 5m in diameter, with the rectangular tomb chamber in the center. These round piles are often found on hill tops. They are built above the surface, rather than digging into the ground, since the hard soil or rock makes it difficult to into it. Each tomb houses a single body. Few items or ceramics accompany the dead. In many cases the tombs were found empty, implying that these were temporary holding places and subsequently the bones were transferred elsewhere to permanent shaft tombs. Between the structures is a cavity. What is its purpose? Along the northern slopes are several round structures, built of large stones. 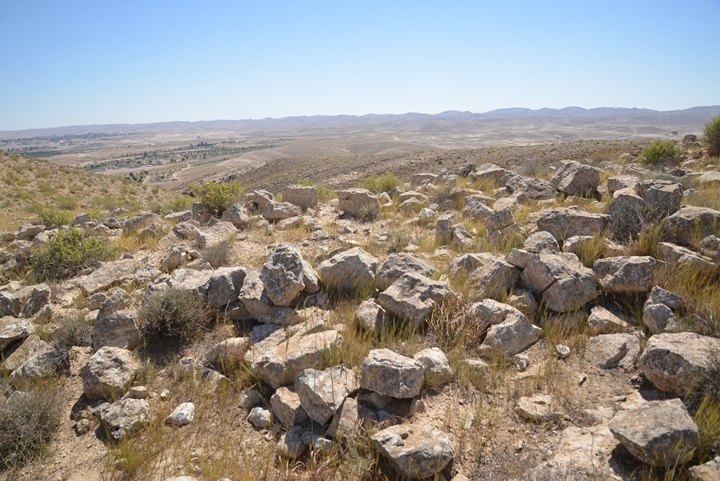 Two round building clusters were found on a saddle between the two hilltops. They are also dated to the Middle Bronze Age I. The northern cluster contains four square and rectangular rooms, on the north and west of three courtyards. The second southern cluster has a circular plan and has four rooms located around a large (9 x 17m) courtyard on its east side. (f) Site #138: Amorite temple? 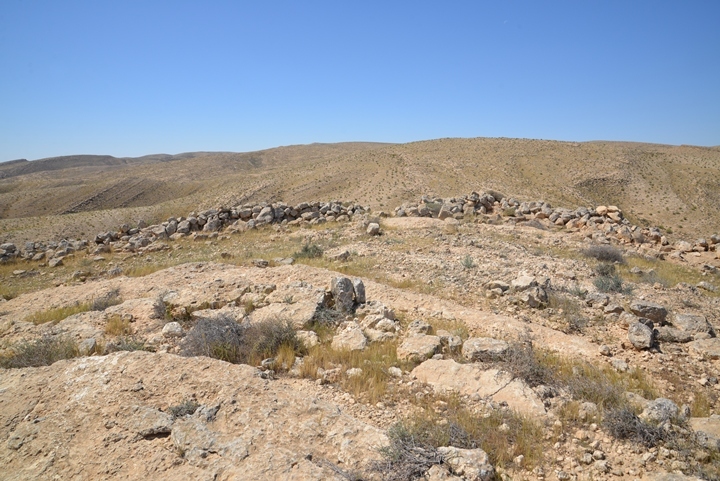 On a hilltop north of the previous site, and east of the main site, is a large (32m x 30m) elliptical area with a wall around it. 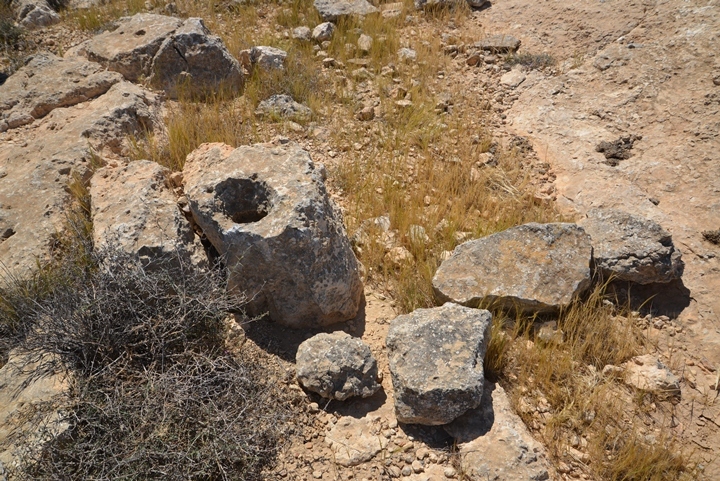 The excavator of the site, M. Kochavi, suggested this was an Amorite temple ("high place"). A closer view of the compound is seen in the next aerial view, also captured from the north side. The ruins of the wall are preserved to a height of 0.5m. This photo is the north side, where an opening in the wall allows an easy entry into the compound. The next photo shows the wall from the south side. 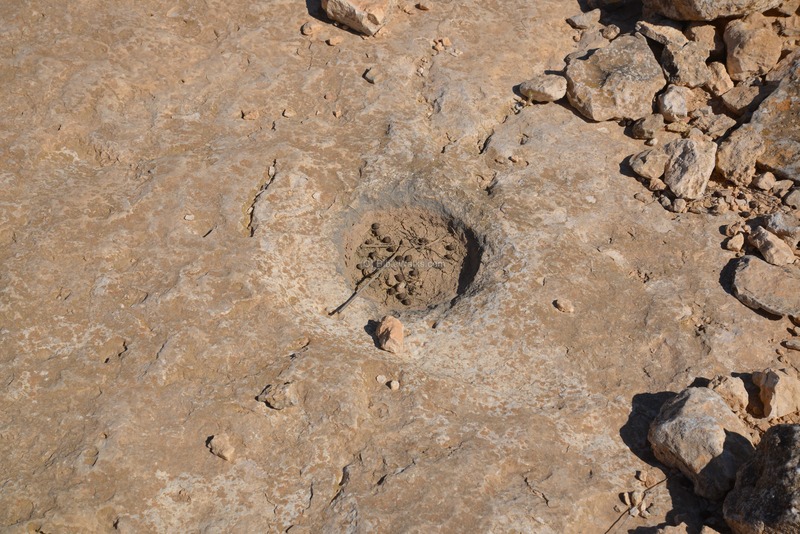 The floor of the structure is the bedrock, and it is dotted by cup marks. An scarificial altar stone is located in the center of the area. 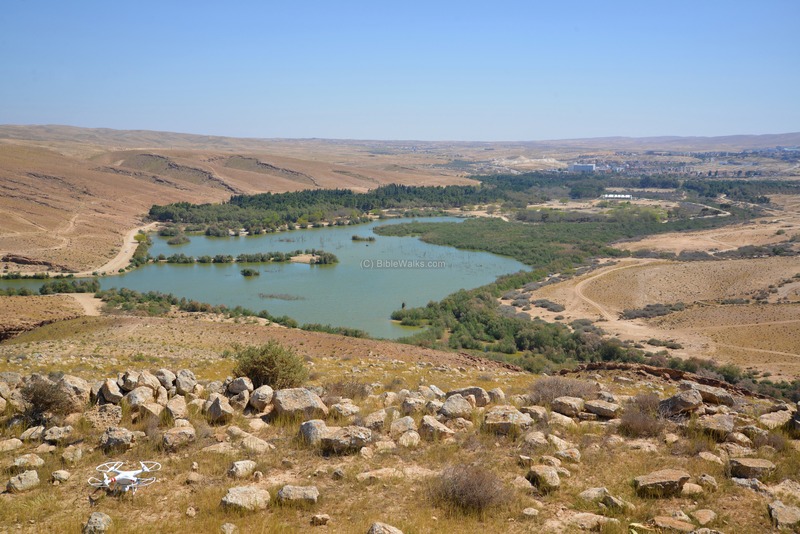 The site overlooks the entire area of lake Yeruham. 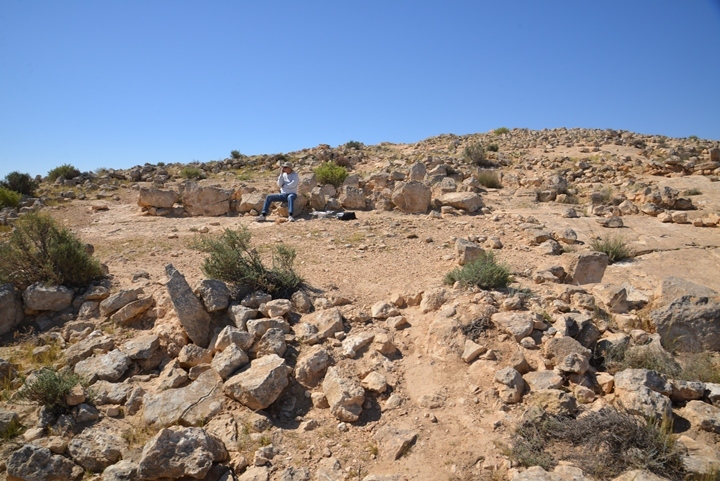 On a slope east of the hill are remains of a long (8 x 10m) rectangular structure. On its north side is a semi-circular courtyard (7m diameter). 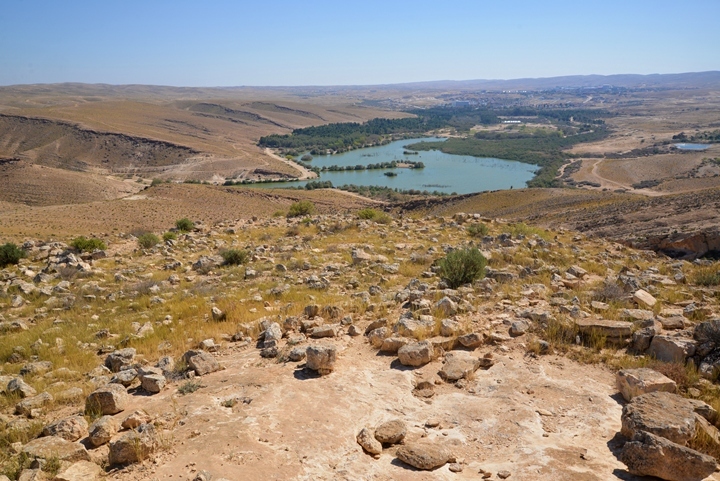 From the Amorite temple is an easy descent down to the lake. The path, on the west side of the ridge, looks like it is unnatural - cut into the side of the rock. The path descends down to a valley close to the lake side. In the valley on the edge of the path are a number of cup marks, and possibly a reservoir. 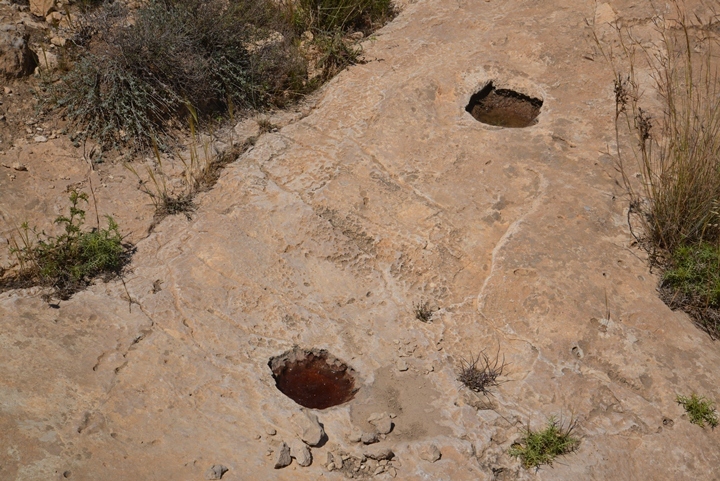 Notice that the holes are filled with water, remains of a rare rain a few days before. The following photo shows the edge of the valley, near the lake. The two hills are the location of the Amorite temple (on the left) and the large MB1 site (on the right). Interesting iron-rich stones and an area with flint is located near the lake. Some flowers grow in this dry area, mostly in the winter period. For example, this flower (Havalvalim? Convolvulaceae?) 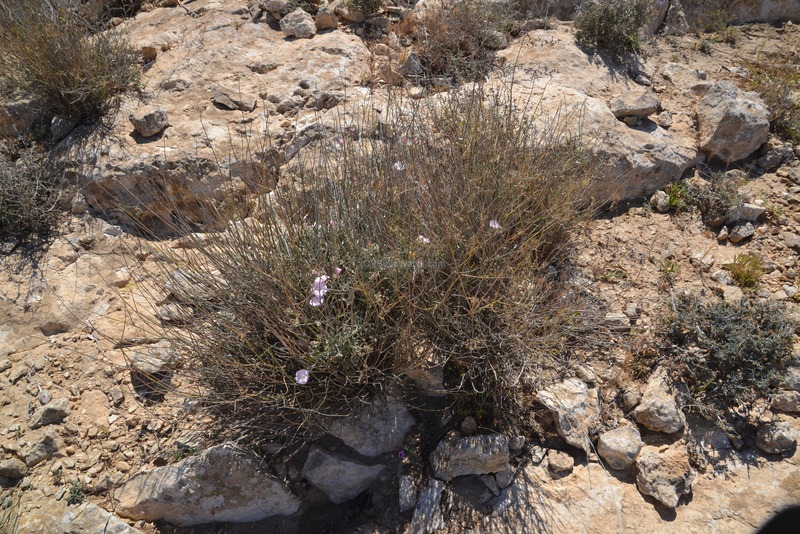 which manages to survive the dry conditions. On the foothills south of the lake is an area where of the yellow Sternbergia clusiana (Hebrew: Halmonit), that flowers during the autumn period. Lake Yeruham is located 3km west of the town. 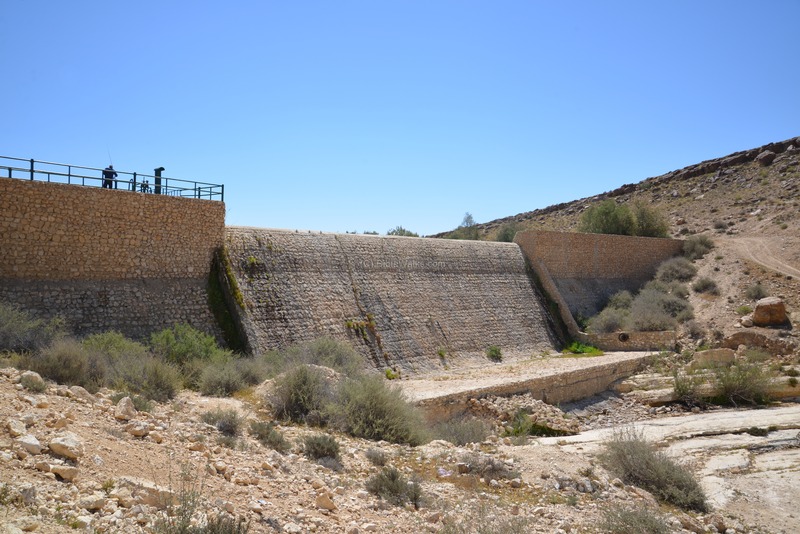 It was constructed in 1953, initially as a reservoir that supplied agriculture water. The area of the Lake is 150 Dunam (15 Hectares). In order to store the runoff waters during the winter, a large dam was constructed. It is 80m in length and 15m high, blocking the stream of Nahal Revivim. Starting in 1974 the reservoir was enhanced to become a regional park. 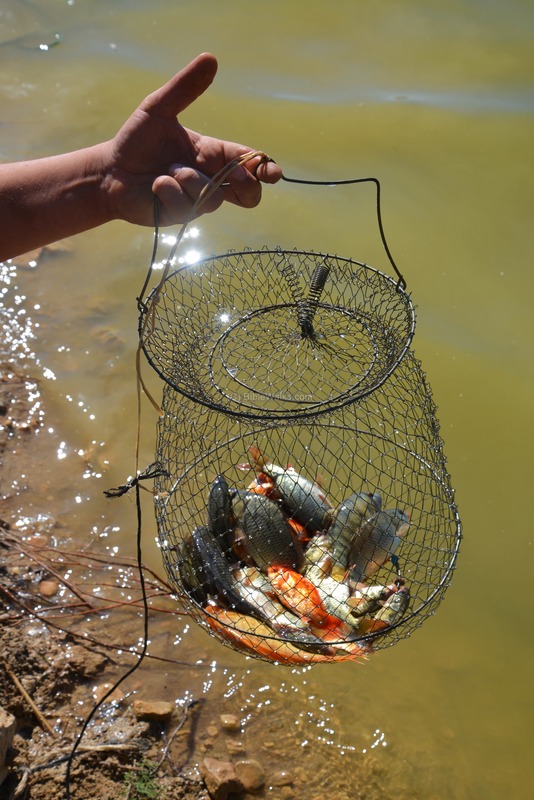 The town council added fish to the Lake, which became a popular site for dozens of fishermen who come here on weekends. The fish includes various types of cyprinids (Hebrew: Carpion), including gold fish. Note that the lake was reported to be often polluted by sewage, so the state of the water should be checked as a friendly warning. Yeruham - the town was established in 1951. Har Yeruham - Har - Hebrew: mountain. 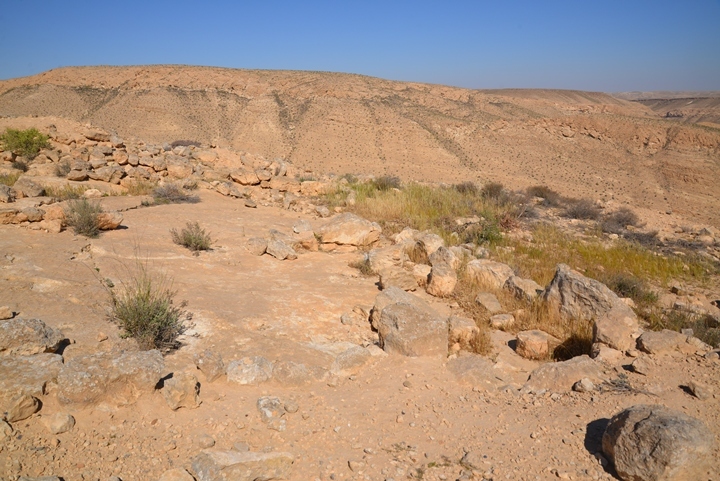 Khirbet A-Rakhma - Arab name of Tel Yeruham - an Iron Age site on the west side of the town. In Arabic: the ruins of mercy (named so as there was a tomb on the hill of an important Sheikh).